In 2016, after extensive in-house testing, UF added the Fireball range to their extensive portfolio of car care and detailing products. 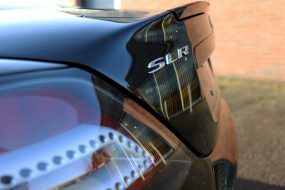 The South Korean brand is well known amongst professional detailers for incorporating silicon dioxide (Si02) technology, for their unique post-sealant maintenance options and the extreme hydrophobic nature of their products. So, when a local independent Ferrari specialist delivered a Ferrari F430 Scuderia to UF’s Brands Hatch Detailing Studio for pre-sale preparation, it seemed the perfect opportunity to showcase some of Fireball’s innovative products. 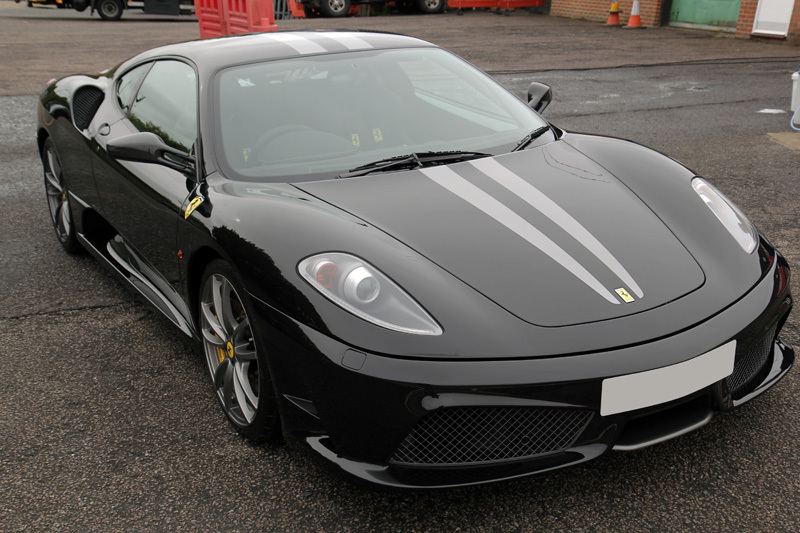 The Ferrari 430 Scuderia is a mid-engined V8 road car boasting 503bhp (20bhp more than the regular F430) and was marketed as having a performance reminiscent of the Enzo in spite of the Enzo producing 650bhp! However, the all-aluminium Scuderia weighs a whopping 85kg less than the stock F430 and this, combined with a host of weight reduction measures, a top speed of 198mph and the fact it’s capable of delivering 0-62mph in 3.8 seconds, certainly puts the F430 Scuderia into the ‘exciting’ category! 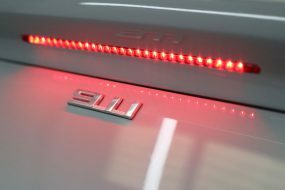 As Michael Schumacher reportedly contributed significantly to the development of the Scuderia’s advanced stability control system, it was hardly surprising when EVO rated the Scuderia 5.5 and predicted it would achieve ‘all-time great’ status. When the Scuderia arrived, it was covered with dirt and debris which had collected over the bodywork, under the wheel arches and even inside the bonnet. 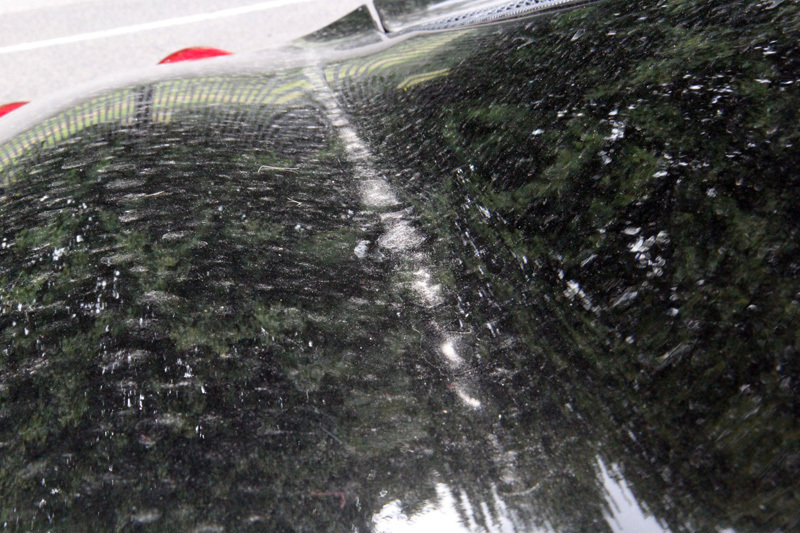 Along with the accumulation of fallout, water spot marks were also highly visible on the black paintwork. 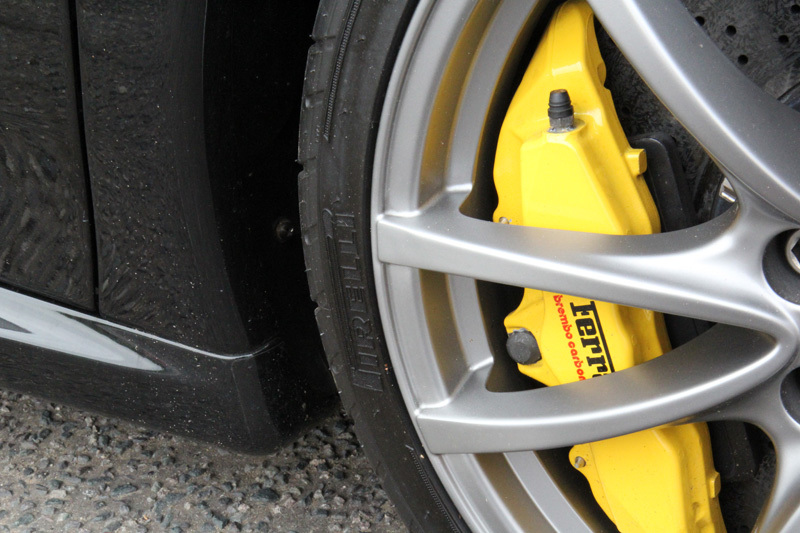 The F430’s Carbon Ceramic Brakes reduced the amount of iron contamination present, however, due to the potentially damaging effects of brake dust particles which may have been collected from other vehicles, it would be necessary to treat the bodywork and wheels for this too. 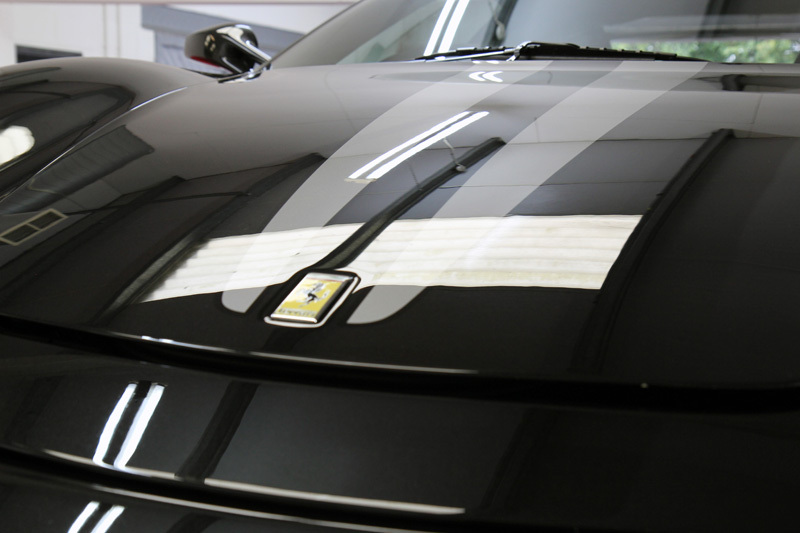 First, the Scuderia was treated with Fireball Ultimate Iron Burn, a spray-on solution with an active ingredient that changes colour on contact with iron contamination. Iron Burn shrinks the metal particles causing them to break their bond with the clearcoat. 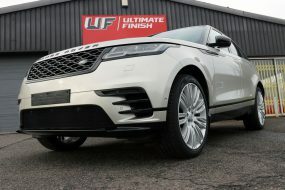 Next, to remove any adhesive contamination such as tar deposits and tree sap, Ultimate Tar Remover was sprayed over the vehicle, dissolving the sticky bonds and allowing the contamination to be rinsed away. Premium Active Snow Foam was then applied using a Kranzle-adapted Professional Foam Lance attached to a K-1152 TST pressure washer. 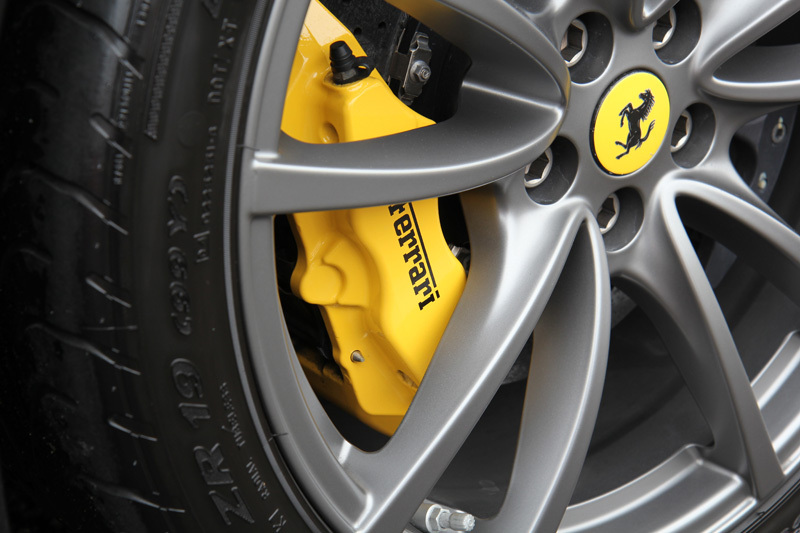 This creates a rich, thick lather to coat every inch of the Scuderia. The surfactants act on the road grime while the foam lifts larger particles of dirt and grit away from the surface of the vehicle, encapsulating the contamination. This solution was also used to pre-wash the wheels and long-handled Wheel Woolies allowed thorough cleaning, reaching through the alloy spokes to the rear of the rim. Fireball Ultimate Car Shampoo was then added to a Wash Bucket whilst a separate Rinse Bucket was filled with fresh water. Both buckets were equipped with Grit Guards. 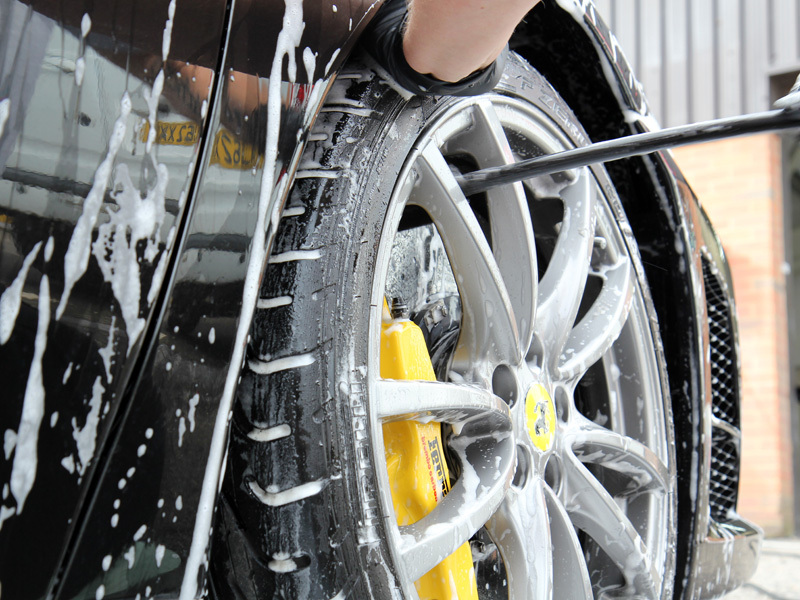 This method, known as the Two Bucket Method, is a safe way of washing a vehicle. Swirl marks are typically introduced by dirt trapped in the pile of a mitt which is then unknowingly rubbed over the paintwork during washing. Rubbing the mitt against the Grit Guards during rinsing efficiently removes these particles from the pile. 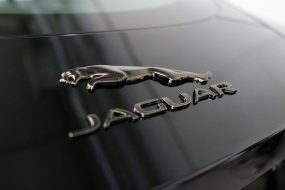 Keeping rinse water separate from wash water helps prevent dirt already removed from the car being reintroduced. Subsequently, the soapy wash water remains clean, so each pass with the wash mitt is made with clean wash water. 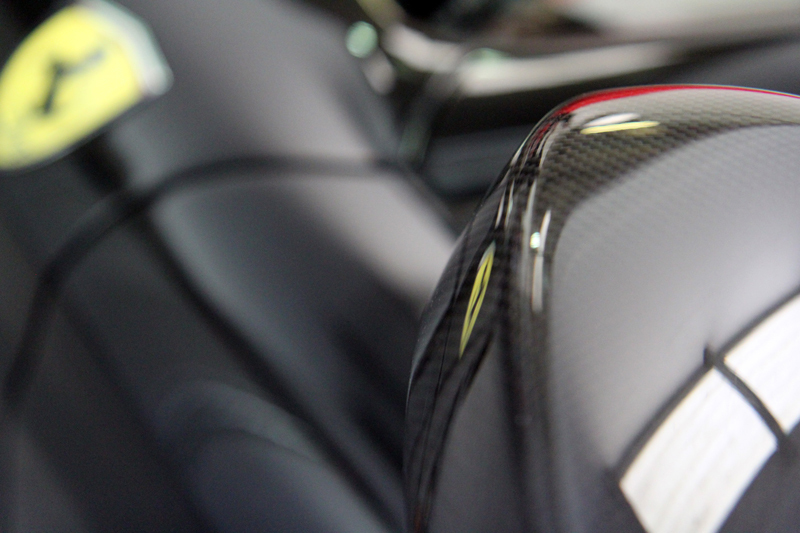 Once clean, the Scuderia was rinsed using a pressure washer before an Aqua Gleam De-ionising Water Filter was attached in-line to deliver a final, pure water rinse. The media within the filter neutralises the elements in tap water which cause white water spot deposits. 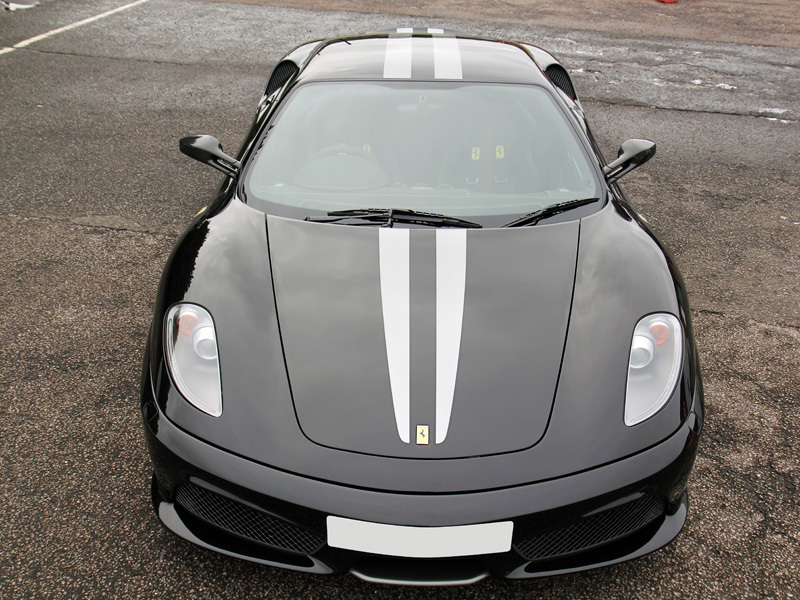 The Scuderia was then dried using Fireball Black Fox Twist Microfibre Drying Towels. Now decontaminated, clean and having been towel dried, an air blower was used to ensure all water had been removed from any areas likely to trap moisture. 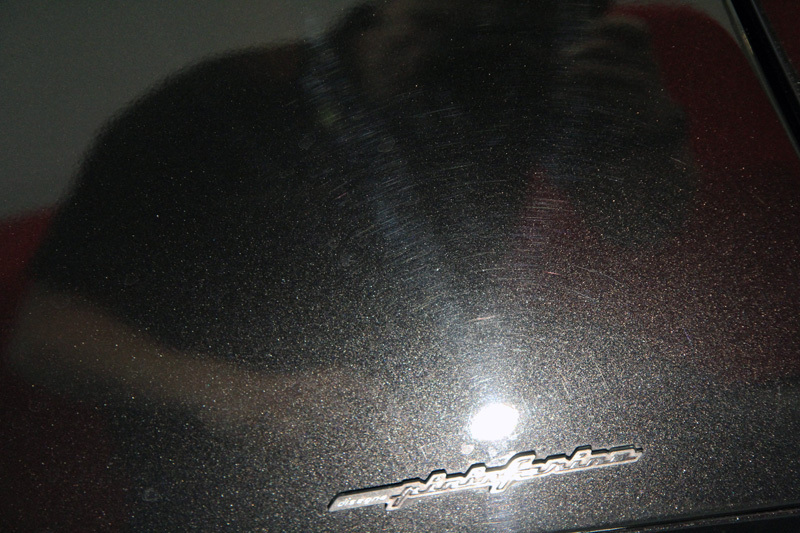 The paintwork was inspected using a SCANGRIP Sun Match 2 high-intensity light to reveal its true condition. A myriad of wash swirls was evident and these would require machine polishing to remove. 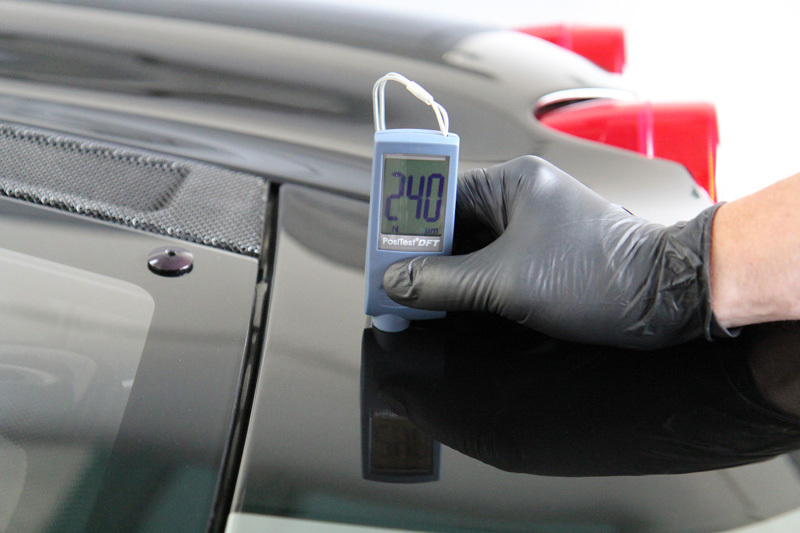 Prior to any correction treatment being carried out, multiple paint depth readings were taken over each panel using a PosiTest DFT Combo Paint Depth Gauge. This measures non-magnetic coatings on steel and non-conductive coatings on aluminium, brass, etc, automatically recognising the substrate and taking a measurement. 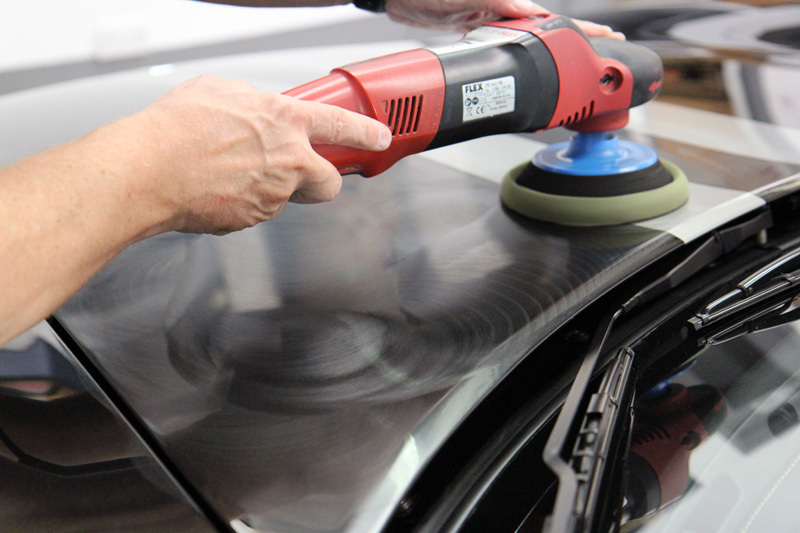 As any correction work means the removal of a few microns of clearcoat, it’s essential to know the existing levels. In this instance, a FLEX PE14-2-150 Rotary Machine Polisher was used with a 3M PERFECT-IT II Yellow Polishing Pad and SCHOLL Concepts S20 Black. 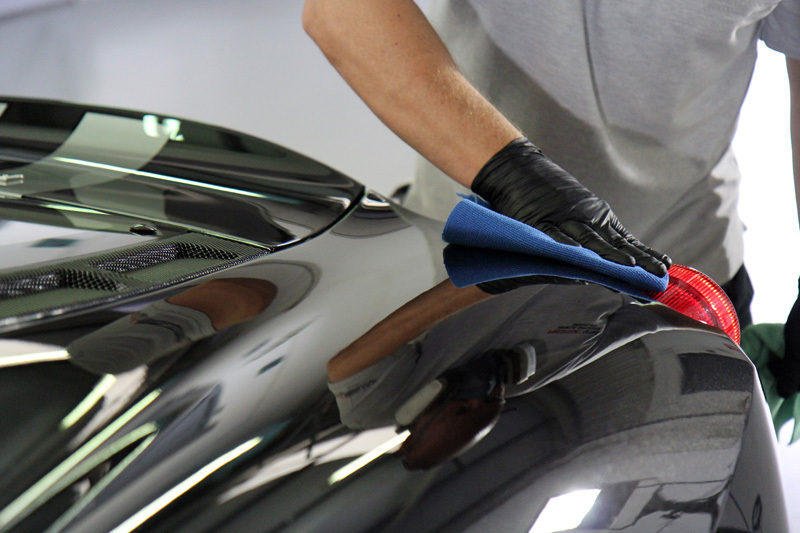 Ideally suited to darker paintwork, S20 is a one-step compound with diminishing abrasives capable of removing swirl marks (and heavier blemishes, if necessary) breaking down to a micro-fine cut to leave a hologram-free high gloss finish. 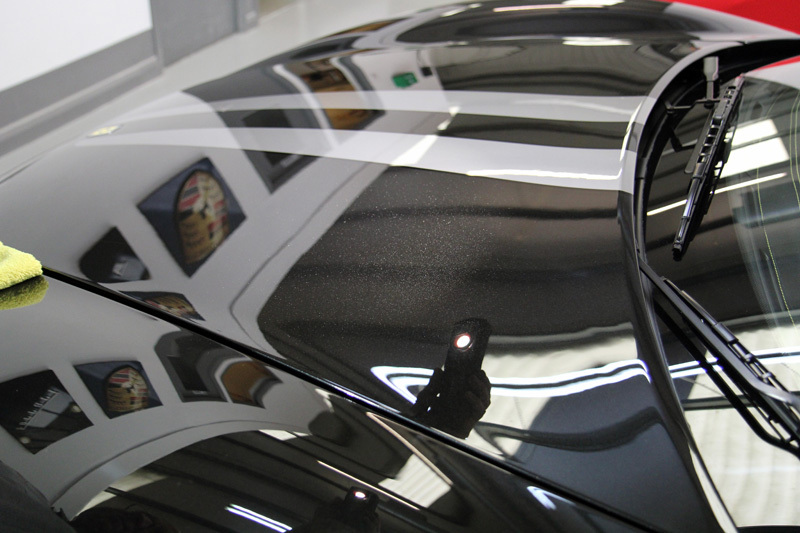 With the paintwork clarity restored, the panels were prepared using Fireball Ultimate Paintwork Cleaner. 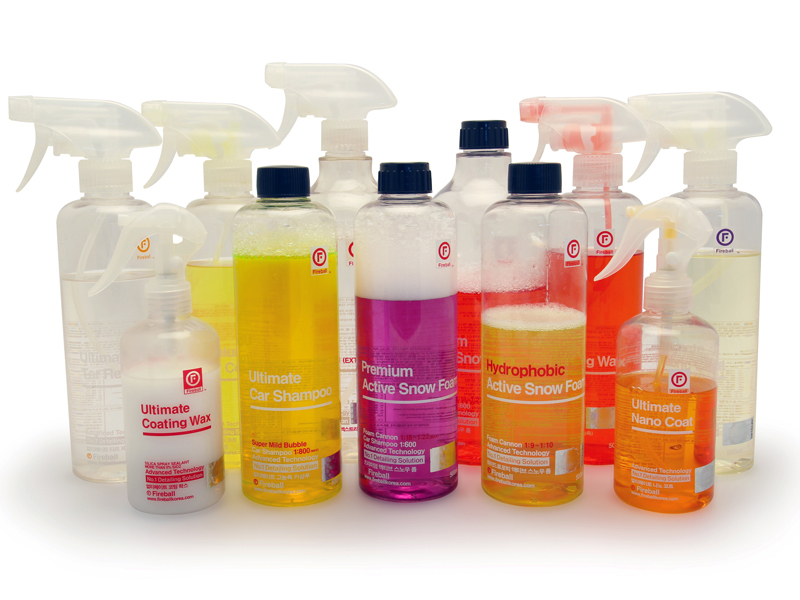 This contains gentle chemical cleaners formulated to eliminate polishing residues. 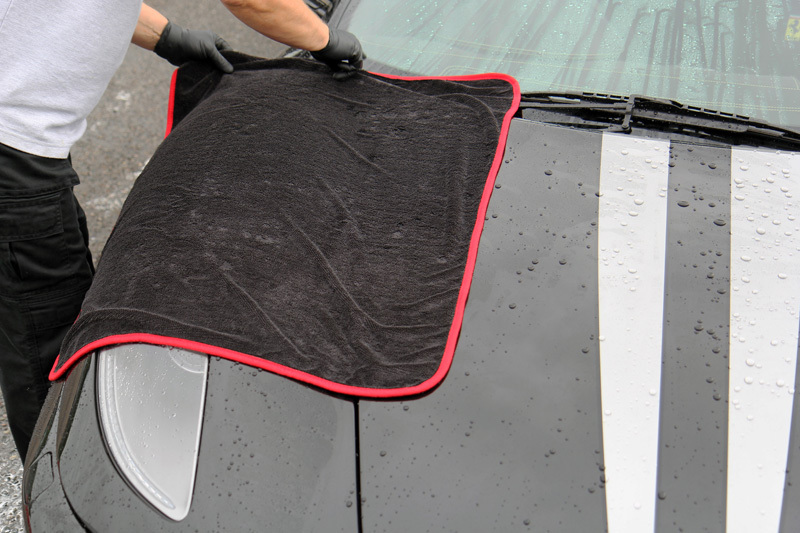 It can also remove remnants of old wax and polymer sealant if required and can be used immediately after washing whilst the vehicle’s surfaces are still wet. 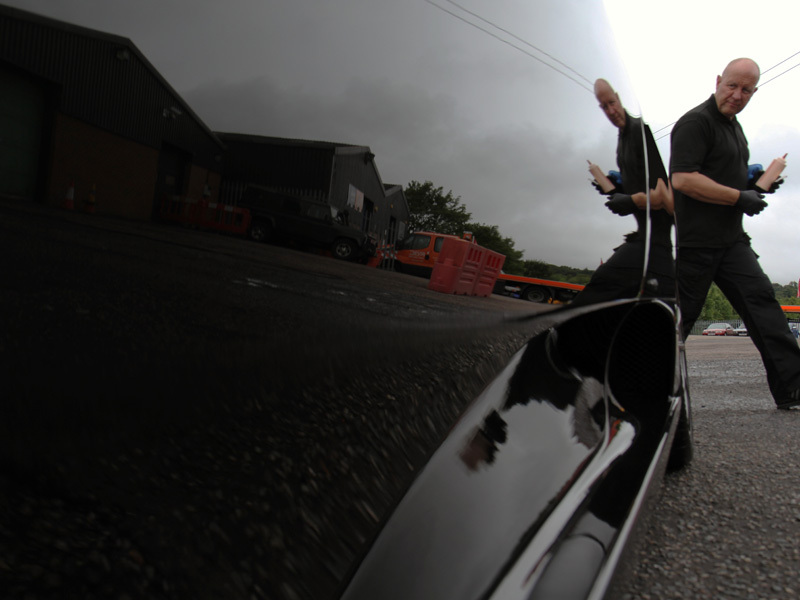 To protect the finish, Fireball Ultimate Carnauba Wax was applied and carefully buffed off by hand. 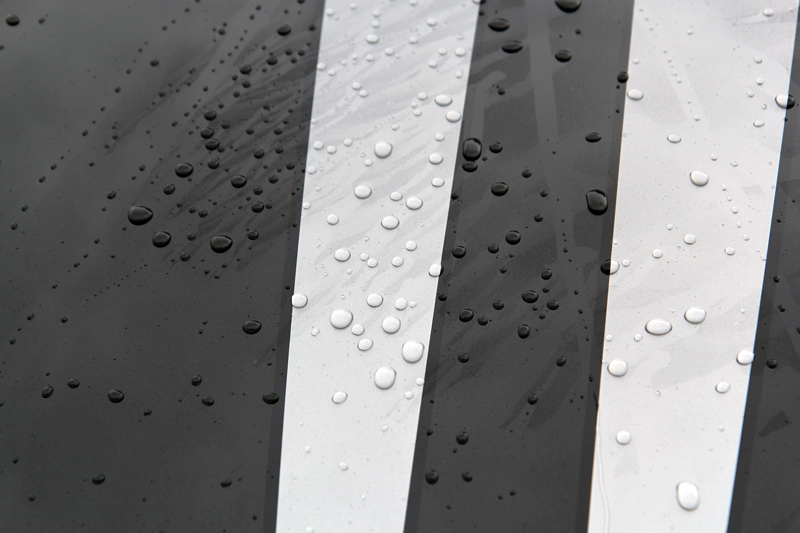 The carnauba content delivers a deep, wet-look shine that looks particularly impressive on darker colours. In addition to enhancing gloss levels, Ultimate Carnauba Wax forms a hydrophobic barrier that encourages water to bead intensively. Contamination such as dirt, grit, tar and tree sap will not adhere as stubbornly to treated surfaces. 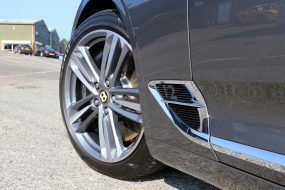 The wheels were also given a coat of Ultimate Carnauba Wax to protect from contamination build-up. Fireball offers two tyre dressings, Tyre Coating Wax Red and Tyre Coating Wax Blue depending on whether a gloss or matte look is desired. In this instance, Tyre Coating Wax Red was applied for a natural satin effect. Fireball also produces unique forward maintenance products developed to increase both the durability and hydrophobic properties of the wax or sealant layer, making them ideal for professional detailers or dealerships wanting to maintain customer’s cars quickly and effectively. Fireball Hydrophobic Active Snow Foam is designed to boost the hydrophobic property of an existing wax or sealant layer. Usually applied through a foam lance to a wet car and allowed to dwell for around 60 seconds before rinsing off. 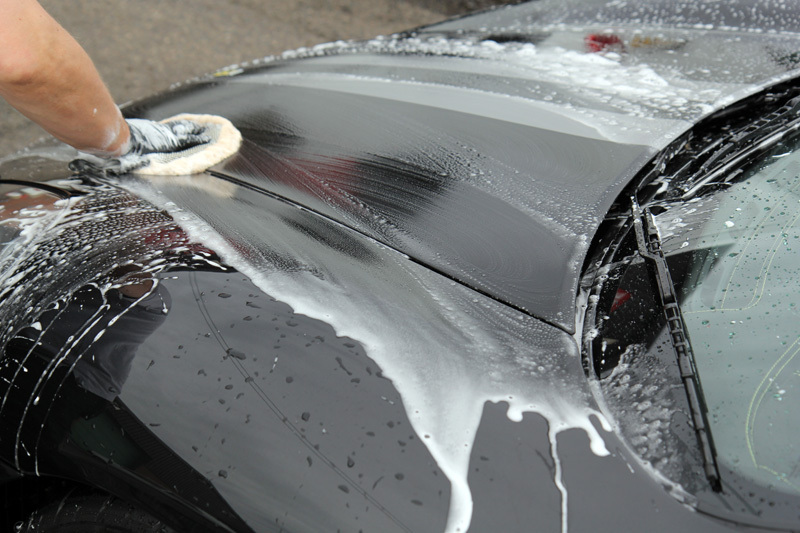 Premium Easy Coat is a time-saving and easy way to boost gloss levels, simply spray onto wet bodywork and wheels and buff off using soft microfibre towels. If you have any questions about the Fireball range of products, please get in touch either by emailing sales@theultimatefinish.co.uk or calling on 0333 800 8004. Our team is on hand, Monday to Friday, 8am thru 6pm to take your call.